We’re thrilled to announce Mattermark is now available on the Salesforce AppExchange. A CRM is only as good as the information inside it, and in the business of sales, it’s incredible how much manual data entry sales representatives perform in their day-to-day just to keep it fresh and actionable. We built our Mattermark integration with Salesforce to help modern sales teams get the deal intelligence they need to work smarter and win more deals with automatic data enrichment of accounts, contacts, and leads. 1. Warm Your Opportunities: With lead enrichment, focus on the prospects that matter, and earn the right to connect through substantive conversations. Make highly personalized observations based on accurate, timely, useful data placed right next to the lead or opportunity in Salesforce. Congratulate a prospect on a funding round. Ask an incisive question about the company’s recent burst of traffic. Make other highly personalized observations based on Mattermark data. 3. Increase Your Sales Productivity: Many companies use Salesforce to manage critical business relationships. Complete, up-to-date access to customer data improves productivity by providing an informed basis for making strategic decisions on how to conduct outreach to leads and accounts. 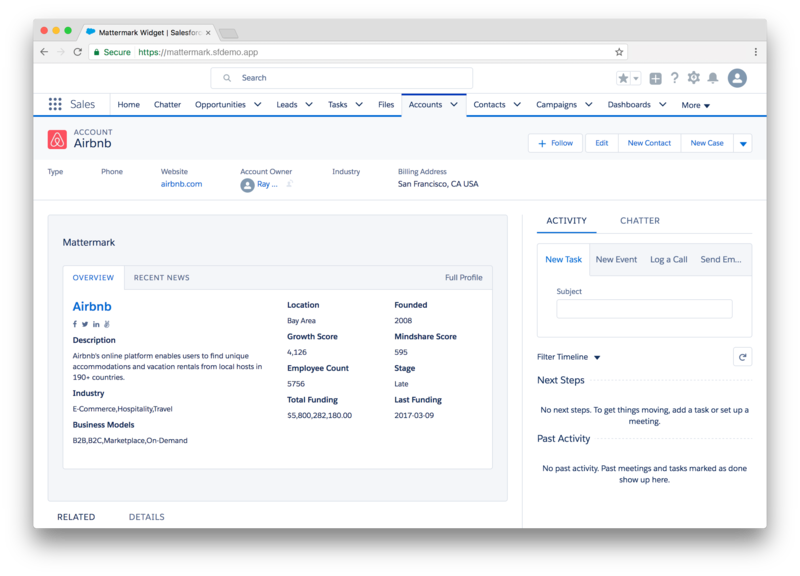 Mattermark allows sales and customer support teams to not only view up-to-date company information, but create triggers and actions to appropriate sales members, and edit lead details within Salesforce. With the power and magic of having Mattermark live directly in Salesforce, you’re able to do all of the above in just a few clicks and everything updates automatically. Because our data is inside Salesforce, instead of an iFrame, you can do a lot more with it. Use a few of our 81 available data fields to create triggers and actions that work for your sales organization. Yes, that’s right. 81 fields. From employee count and web traffic, to last funding details and investors, you can set up Mattermark to fit and enhance your existing Salesforce workflow. We envision a future where sales professionals spend more time doing what they do best, and what computers can’t do: cultivating business relationships. Whether you’re an SDR, Sales Exec, or VP, your time is best spent on the phone or in person cultivating the relationships that earn you the right to do business. As transactional sales becomes more automated and quotas continue to rise, working smarter is the best way for sales professionals to rise through the ranks to the next level of attainment and career growth.